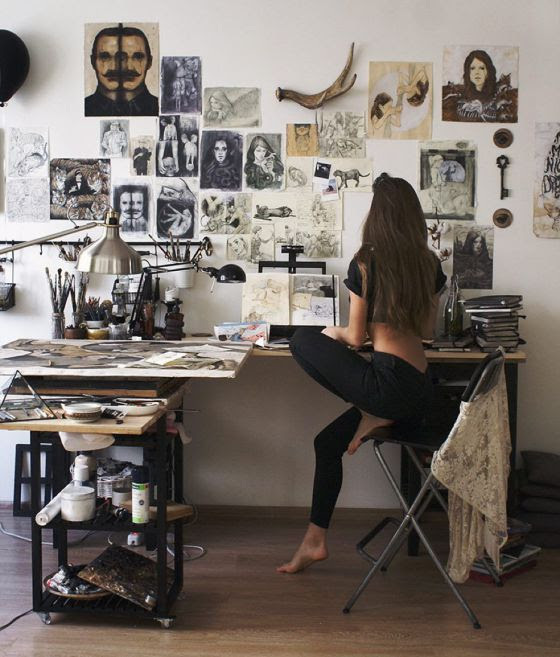 Natalie had calculated the exact number of images and other objects suspended on the wall at a glance. She filed away that value, along with item categorizations, for later use. She did the same for the books, opened and closed, the number of light sources, active and inactive, brushes, pencils, liquid, semi-liquid, and solids containers. In less time than it would have taken her to brush her long, thick, brunette hair, she had learned everything she considered relevant about the room’s interior. However, she had yet to discover what it all meant, at least beyond the literal understanding. “Noel Gray is an artist.” She uttered the words like a holy revelation, even though she had been provided with that information before arriving here. She correlated what she knew of art in general, then of graphic design, types, media, notable examples of artists and their works, and then compared that data to everything in the room and what she knew of Noel Gray so she could construct the necessary context. George had related to her what he believed was necessary for her to know about her assignment, and then had the Uber deliver her to the address just past noon. The front door was open, which she expected, and her instructions only said to go to Noel’s studio and wait. She heard the front door open and close downstairs and presumed it to be Noel Gray. Leaving the door unlocked, the person who just entered could have been anyone, but the probability was low. Then she heard heavy footfalls quickly mount the steps and approach the studio from the hallway. She thought it appropriate to stand and turn to face the entrance rather than keep her back to him when he entered. He opened the door and stopped. She continued to look at him impassively, calculating height, weight, noting physical imperfections in his skin, assessing his vision impairment by the lens design of his eyeglasses, also noting his apparent age and cataloging his clothing preferences. The exact meaning of his facial expression and body language eluded her. “Oh, forgive me. We haven’t been properly introduced. I’m Noel Gray.” He extended his hand. She knew the social gesture, stepped forward and grasped his extended palm, applying just enough pressure so he could feel her grip. “Natalie Iara. Pleased to meet you.” She smiled slightly, visually confirming that she was “pleased” to become acquainted to him and to be in his presence. “Well then…” he clapped his hands together. His respiration rate, perspiration, pupil size all indicated he was experiencing anxiety. “Thank you. That would be nice.” Natalie was attempting to put Noel at ease utilizing a combination of facial expression, body language, and vocal tone, however meeting her was likely a new experience for him, and George said to expect an adjustment period. He took her to a bedroom down the hall opposite of his. She cataloged the bed, night stands, light sources, wall paintings, contents of the closet which, among other things, held the clothing she would require during her stay. There were various toiletries in the adjoining bathroom. This was one of those areas of interaction she needed to enhance. Natalie knew she was expected to develop a relationship with Noel and that it would be time-consuming. She had the understanding that each transaction between the two of them would add to her knowledge, helping her to become more sophisticated. She grasped the dark, grey instrument and started describing precise, thin lines. Natalie complied with the instructions to the best of her ability, but he was asking her to perform a task for which she had minimal skill. She accessed a backup file stored in one of her implants, but she couldn’t integrate it into her current experience. Walking downstairs with the young woman, he recalled the details of the medical file George had sent over when he was hired to tutor Natalie. She had almost died in the accident, and if artificial intelligence, nanotechnology and synthetic neurosurgery techniques hadn’t become so advanced in the past half century, she either would have perished or become permanently comatose. George, the AI system that repaired her brain damage and augmented what little of her human personality she had left with a series of nano-neural systems, had done all he could to return Natalie to normal functioning. However, he couldn’t teach her to be a person again, let alone the foremost artist of her generation, what she had been a year and a half ago. Noel tenderly guided her out the back door and into his expansive gardens. Right now, it was just another environment for her to experience and evaluate. Someday, he hoped to help his former student appreciate and feel beauty again. I wrote this for Photo Challenge #232 hosted at Mindlovemisery’s Menagerie. The idea is to use the image as the inspiration for crafting a poem, short story, or other creative work. Usually, the images in this challenge are pretty surreal, so today’s photo looked ordinary by comparison, and it took a while for my muse to come up with something. It’s always bothered me that movies like The Terminator (1984) always depict a self-aware and conscious AI as having a personality, usually malevolent, and being at odds with human beings. I came across an article called Will AI Ever Become Conscious which was very helpful. I wanted an intelligence and sense of self-awareness in my cyborg Natalie that was both human and machine-like. It’s hard to balance the two. Native American, Tupi – From Tupi y “water” and îara “lady, mistress”. In Brazilian legend this is the name of a beautiful river nymph who would lure men into the water. She may have been based upon earlier Tupi legends. Obviously, her first name comes from the photo credit. I went to Quora.com to find out what’s the first thing to learn about drawing. My first impression was that you were trying to describe a character with a form of autism. Then I began to wonder if she might be an assassin, either coldly human or possibly cyborg. Your reconstructed accident victim then appeared as something of a surprise that might be not too far removed from my first impression. In the future, what if we could replace damaged parts of the brain with some form of cybernetic implants, augmenting natural intelligence with artificial intelligence? Then it would be a matter of exposing such a person to “humanizing” experiences in order to help the person recover at least some of their personality. Interesting question. However, if a given personality is developed from many years of accumulated and processed memories of experiences, and those memories are no longer available, the original personality could never be recovered. The personality developed from new experiences would be a new personality, especially if AI also changed the characteristic capabilities with which even the original experiences were observed, experienced and processed. Even existing memories might be re-processed to form different response-patterns. Another sort of question then comes into consideration. If there exists a kernel of personality that is *not* based on lived experiences, such as the Jewish concept of the neshamah, in what degree might that neshamah be able to reassert itself in its new psycho-cybernetic environment? Would it tend to color the resulting reconstructed personality to become more recognizable to those who had known the original person prior to their damaged condition? The only model I can envision that might begin to answer such a question is the example where someone who has not seen a particular person since childhood nonetheless detects in them familiar character traits remembered from their prior acquaintance. In such cases subsequent memories and experiences apparently have not changed the individual so much as to obliviate the personality traits that were visible already before much experience could influence them. Very imaginative. And intriguing. I was waiting to see how it progressed.